(UPDATE: Nate Friedman is the winner of Willie's 1st Annual Free Book Giveaway. Please contact me by the email: william.coppage@ymail.com. Since so few entered, all I hope to do something special for everyone else, as well. Thank you all for participating and spreading the word of poetry). 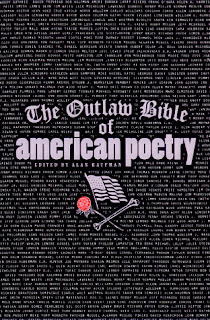 In celebration of National Poetry Month, at the end of April, I will be giving away a copy of The Outlaw Bible of American Poetry edited by Alan Kaufman. You must upload a video of yourself reading a poem. The poem should be sonnet length (at least 14 lines). To enter, either post the video link in the comment section of this post, or as a response of the youtube clip I uploaded. At the end of April, I will randomly select one person as the winner. I will contact the winner through email. Let's have fun. This is in hopes to get more people engaged with poetry. Please spread the word and repost the link. I am going to try to keep the new video posts up to date of all the participants. Keep them coming. man what a pleasure to read one of my favorite poems! what a great idea for a way for poetry people to interact and spread poetry! This is great. We got three and I know more to come. Having three reminds me of Arlo Guthrie's "Alice's Restaurant": "And three people do it, three, can you imagine, three people walking in singin a bar of Alice's Restaurant and walking out. They may think it's an organization. And can you, can you imagine fifty people a day,I said fifty people a day walking in singin a bar of Alice's Restaurant and walking out. And friends they may thinks it's a movement. And that's what it is , the Alice's Restaurant Anti-Massacre Movement, and all you got to do to join is sing it the next time it come's around on the guitar. With feeling." I feel frisky. I might have to upload another just because. Alright---Today is May 1st and time for one randomly selected winner. First, thank you all for participating. Since it was so few on you, I want to reward everyone, so while the winner will receive the anthology, I want to do something special and fun for everyone. I will post my email at the bottom of this comment. Please send me your address through email and I can get everyone their prizes. and I will have your prize out by the end of the week. Thank you all for participating and maybe we can do something like this again.